Will These Augmented-Reality Contact Lenses Replace Your Smartphone? In attendance at this year’s Consumer Electronics Show was a little known startup showcasing a wearable technology that generates an interactive display right before your eyes. And no, it’s not a knock-off of Google Glass. Seattle-based Innovega, if you can believe it, touts a prototype for contact lenses paired with eyeglasses that promise, through the wonders of augmented reality, an even more immersive experience. The announcement sets the tone for what’s expected to be a banner year for wearable technology. One of the major themes of this year’s convention, which took place in Las Vegas last week, is the various ways the tech industry will build upon the rapidly emerging market for don-able devices such as smart watches, body-monitoring wristbands and, of course, game-changing concepts like the widely-anticipated Google Glass. Reports of the iOptik eyeware system’s development bubbled to the surface as far back as 2010. The Pentagon has been impressed enough with what they’ve seen so far that last year the agency placed an order for a batch of the prototypes. What makes Innovega’s technology so compelling is that, unlike the head-up display equipment developed for the military, the two-piece, iOptik system allows the wearer to watch and interact with flickering imagery without having to shift his or her focus away from the surrounding environment. This is done by pairing a set of unique contact lenses with eyeglasses designed to project digital imagery. When used alone, the eyeglasses function similarly to Google Glass in that data is shown within the peripheral field of view. But with the transparent contacts in place, the micro-projected data is filtered and re-focused onto the retina. 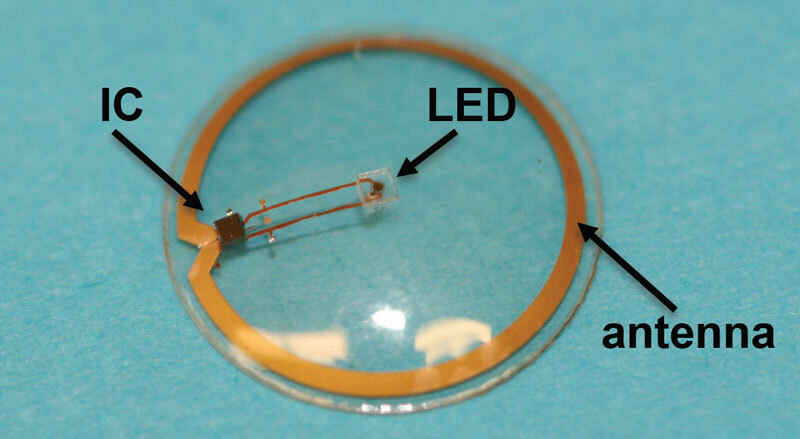 Meanwhile, light reaches the retina through a separate filtering mechanism embedded in the contact lens. These two inputs are superimposed so that they appear as one seemingly interconnected picture. Basically, the system re-calibrates the depth of field so that people can focus on objects in front and in the distance simultaneously. As a stand-alone product, the iOptik contacts can also be customized according to prescription for vision correction, which makes them a viable permanent replacement for conventional lenses. The company is collaborating with an unnamed major manufacturer to produce these individualized variations, according to CNET. Innovega stresses that it has to attain 501(k) market clearance, a process Willey describes as being much simpler than having to attain Food and Drug Administration approval. This hurdle will likely be completed by early 2015. From there, the company expects to sell the technology to manufacturers to feature within their very own products, a strategy that also involves letting external market forces dictate which apps, accessories and additional functions spring from its proliferation. So will we see Apple branded iGlasses with Innovega’s augmented reality? Or perhaps Oakley sunglasses? It’ll depend on who buys into an augmented vision of the future.